Otherwise known as the Gedächtniskirche ,this neo Romanesque church was built-in 1895 by Frans schwechten, the church today features a mix contemporary church architecture as well as the ruins from when the church was bombed during World War 2. 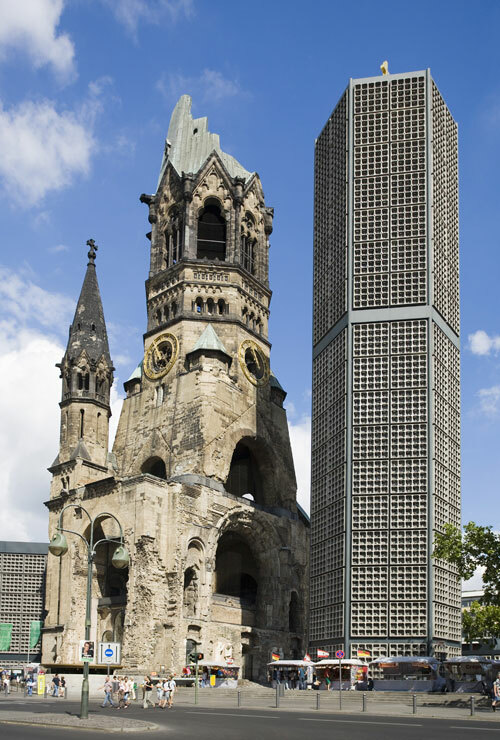 The church is located in West berlin and seen as anti-war memorial for peace. It was built-in 1895 as a memorial to Kaiser Wilhelm 1st who took troops o France, Denmark and Austria and forged new allies returning to Berlin successful, it is considered a symbol of the cold war and now is popular tourist spot. However on our visit to Berlin the church was under construction and the church tower was sheltered. During world war 2 the church was bombed the ruins are still preserved on site, in the 1960’s the church tower was added to by Egon Eirmann creating a jagged silhouette and a hollow shape on the building which it’s now know for as the ‘broken tooth’ in addition to this colour glass were placed in the church, there is only the memorial hall that shadows the horrific damage that the war caused. Eirmann’s new design includes an octagonal shape with hexagonal bell tower and a worship room. The church was consecrated in 1962 on the same day that Coventry Cathedral was being opened after the being bomb also. 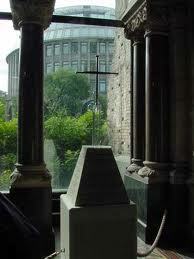 To mark this occasion a cross was made purely from nails from the old Coventry cathedral. Upon visiting the church whilst in Berlin we found that the church is currently being renovated and was all closed off so unfortunately we were unable to visit and photograph the ‘broken tooth’. Hi friends, its fantastic post concerning cultureand entirely defined, keep it up all the time. website, I truly like your technique of writing a blog. I book-marked it to my bookmark website list and will be checking back soon. and extremely huge for me. I’m taking a look forward on your subsequent post, I’ll attempt to get the hang of it! that I really would want to…HaHa). You definitely put a fresh spin on a topic that’s been discussed for decades. Wonderful stuff, just great!